We walked around both Hong Kong Electronics show Wednesday and Thursday. 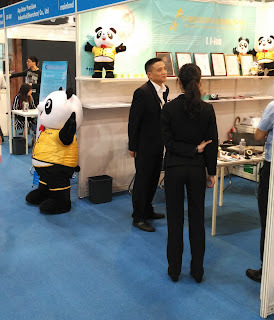 One Chinese factory has a range of Mascots displayed and they caught my eye. A Chinese company in a sea of Chinese companies should look to do something more elaborate or unique since the generic panda is just not so memorable. Replicated all the time. We love plush in general though so a bit torn. What are your thoughts? Any hints on choosing your mascot, designing it, and best materials for manufacture.